I've put off writing this review for some time, for a couple reasons, really, but eventually I knew I would get around to it, so here it is. 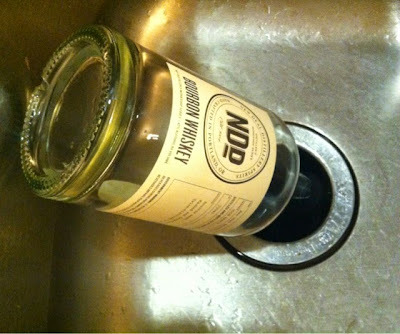 I'll start off by saying that I love what New Deal Distillery out of Portland, OR is doing. While vising Portland a few months ago, I had the pleasure of sampling their line of offerings. They had two different gins, both of which I thought were quite good. They had a white rum that I never would have thought pacific northwesterners could pull off. Their coffee liqueur is one of the best (of not THE best) I've ever tasted, and they offer a hot pepper infused vodka called Hot Monkey which is incredible! So, when the gentleman pouring our samples informed me that they would be releasing a bourbon the following day, telling me that if it's anything like the last release, the entire batch would be gone that day, I was more than intrigued, and, quite frankly, already sold. That next day I showed up at the distillery, eager to get my hands on a bottle. Considering the good work they were doing on everything else they produced, I more or less purchased the bottle sight unseen. I did get a sample, but having already visited a couple other distilleries that day, my palate was untrustworthy at that point. I packed my bottle away in my suitcase and brought it back to Illinois to enjoy at a later date, and eventually I got around to cracking it. The New Deal Bourbon Whiskey is 42% ABV. The label indicates that it is made from "100% grain" (not really sure what else might be used other than grain), that the recipe is a "bourbon mash"and that it was "twice-distilled in a copper pot still." The labeling alone should have tipped me off, but nonetheless, I was going to give it a go. Upon popping the cork, I knew I had made a mistake. The "whiskey" immediately smelled like something was wrong with it. It had the stench of rotten fruit, kind of like that random smell in the kitchen only to find that an apple at the bottom of the fruit bowl was half rotted and spoiled and harvesting generations of fruit flies. And it tasted just as bad. It had no traditional flavors of whiskey (of any type), but rather tasted of rotted fruit, a taste that I just could not get past and could not get out of my mouth. I even tried mixing other whiskeys, including a flavored whiskey, to mask the effect, but to no avail. So it sat in my cabinet, untouched, until a couple days ago when I just happened to reach back and pull it out. I held the bottle up to the light and saw floaties throughout the bottle (keep in mind, this is only two months after purchasing). It was as though bacteria had been harvesting inside the bottle (if that's even possible). They were more than just mere specks, as I've seen in some whiskeys, but rather strands of "stuff" just floating around. At this point, pouring it down the drain was the only option. This "whiskey" has officially set the floor for future comparisons. I've had some bad whiskeys, but none that I just absolutely could not smell, let alone drink, and this is the first I've ever poured down the drain. I really had hoped for more, given how much I loved their other offerings, and when I'm next in Portland I wouldn't hesitate to grab a bottle of their coffee liqueur or the Hot Monkey. But, the bourbon was certainly a regret.